Every year, Osaka and Chiba hold a two- or three-day rock concert at the same time called the Summer Sonic Festival. The majority of the bands playing in Osaka the first day go to Chiba the following day and vice versa. Many Japanese rock musicians from both major and indie record companies and some international acts contain the lineup for the festival that gathers around 200,000 people. Summer Sonic Festival was founded in 2000. This year, Summer Sonic Festival will be held on August 19 – 20, 2017. The Tokyo venue comprises of 8 stages while the Osaka venue has four. Jungle Stage – Idol Sonic will feature 16 pairs of Japan’s new generation idols. This attraction will also feature comedy shows and live performances from DJ’s and other stage performers. Silent disco – a party where the Dj’s play music and the guests uses their headsets/headphones to listen and dance to the music. International artists will also be joining this year’s Summer Sonic Festival such as Calvin Harris, Black Eyed Peas, Foo Fighters, Sum 41, Good Charlotte, Liam Gallagher, and Lany. As early as August, tickets to the event will be selling like hotcakes, so grab yours earlier if you want to experience one of Japan’s most iconic music festivals. We’ve known that Marina Bay Sands, Changi Airport, Merlion Park, Universal Studios Singapore, Jurong Bird Park, Sentosa Island are brands that Singapore owns. They are Singapore’s word-class attractions that brings millions of visitors annually. But do you know that Singapore despite being a young nation, still has a lot to offer to the world? It has more than 100 historic sites, complete with markers that tell the stories of days gone by. By taking the road less travelled, you will be surprised at just how close to your doorstep such adventures can be. Singapore National Day celebrates its 52nd Independence on August 9, 2017; let’s dig deeper into the nation’s very rich cultural and natural heritage as we present some of its hidden treasures. 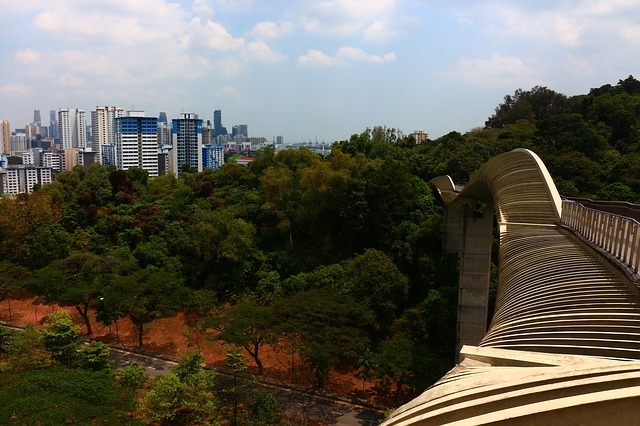 The Southern Ridges is a beautiful 10km stretch of green open spaces perfect for walking trails, spanning the hills of some of Singapore’s most popular parks and gardens, connected by picturesque ridges and pathways. It crosses Kent Ridge Park, Mount Faber Park, Telok Blangah Hill Park, Hort Park, Labrador Park and Harbour Front on the Southern Ridge of Singapore. At the top of the trail is the Jewel Box, a bar, restaurant and refreshment area. Southern Ridges is characterized by sheltered areas, rain forest and a variety of flora and fauna in their natural habitat. The place offers panoramic views and amazing sights and sounds of the forest. This is one of Singapore’s abandoned reservoirs that has been off the map and was rediscovered in 2014. The 2m-deep forgotten reservoir, reported to be dated as early as 1905, had appeared in the early maps. But by the fifties, it had vanished from the maps and its location was not officially marked for sixty years. Remnants of the reservoir still exist today, such as concrete steps, an old diving board and a bathing area. New pipes and pumps, appear to be in fine working conditions, linking to the reservoir that is only about one-third of an Olympic-sized swimming pool. The reservoir still has a working water filtration system and houses many different types of wildlife. Fort Siloso is a former coast artillery battery. 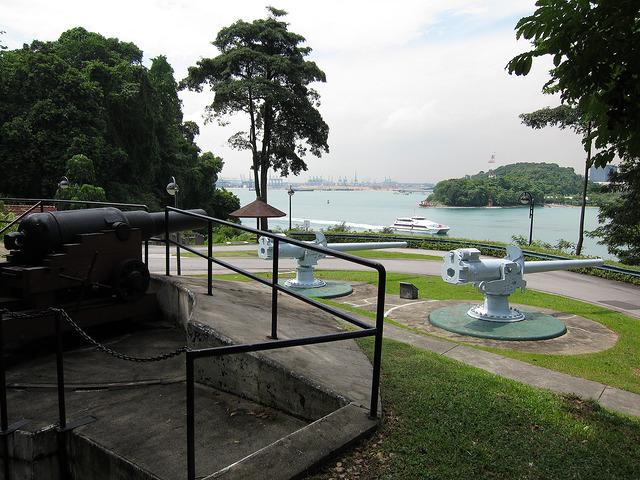 It is the only remaining battery which has been restored, out of the twelve batteries placed in strategic positions which comprised “Fortress Singapore” at the beginning of WWII. Today the fort has been fitted with elements to bring history alive for the tourists. There are interactive exhibits recreating dramatic scenes from the part. Visitors are taken on a tour tram as guides describe the site and explain its role in the defense of the Malayan region. Visitors can explore the tunnels; see guns and cannons, film clips and historic photographs. 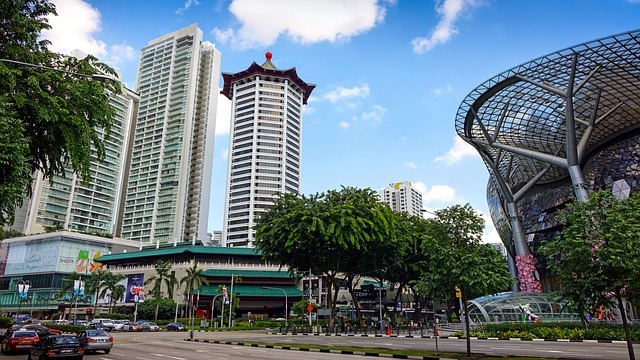 Commonly referred to as Orchard, it is a boulevard that is 2.2 kilometers long and considered Singapore’s shopping and entertainment hub. It is locally called Tang Leng Pa Sat Koi by the Chinese Singaporeans and Vaira Kimadam by the Tamil people. Orchard Road gets its name from the numerous plantations and orchards that were present in that area in the 19th century and earlier. Popular legend also attributes the name to Mr. Orchard, the owner of many of the plantations in that neighborhood. Some of the numerous buildings from the colonial times that are worth checking out; are now luxury hotels. 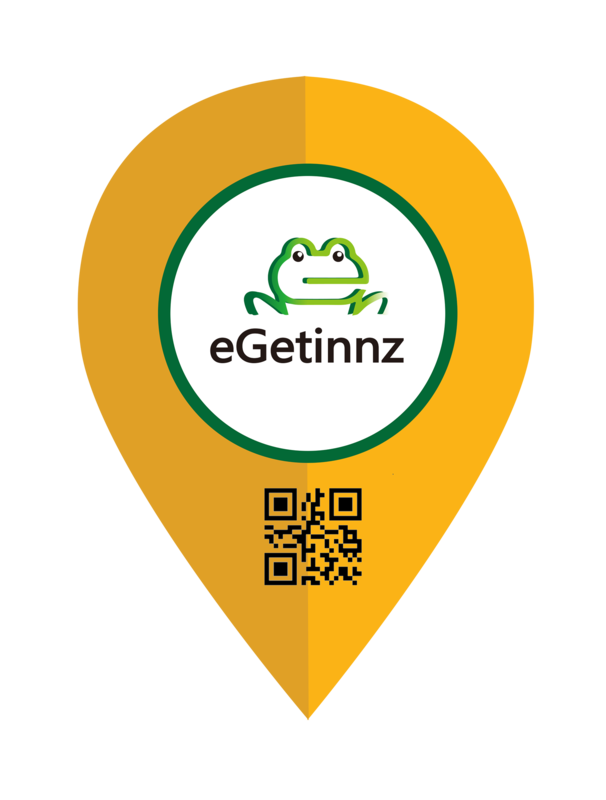 There are a number of cool restaurants and cafes to visit for some great food. It is also home to Istana, the official residence of the President of Singapore. Pulau Ubin which literally means “Granite Isalnd,” first appeared on a map in an 1828 sketch of the Island of Singapore as Pulo Obin and in Franklin and Jackson’s map as Po. Ubin. 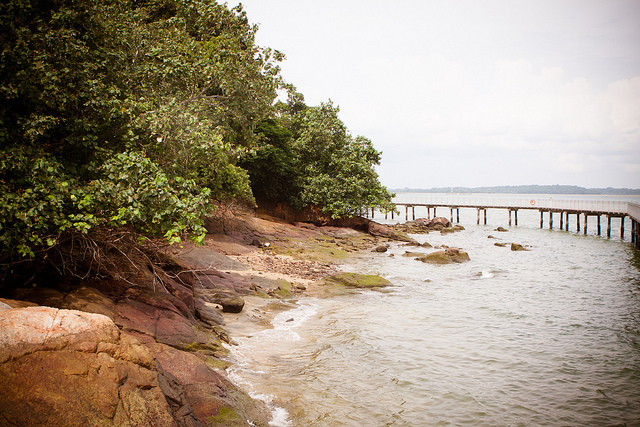 Simply known as Ubin, it is an island situated in the north east of Singapore, to the west of Pulau Tekong. Granite quarrying supported a few thousand settlers on Pulau Ubin in the 1960s, but only about a hundred villagers live there today. It is one of the last rural areas to be found in Singapore, with an abundance of natural flora and fauna. Cherry Blossoms or more popularly known as Sakura is also considered as a national flower of Japan. For the Japanese, Sakura symbolizes the clouds because of the way they are blooming. It is also associated with mortality – on readily and gracefully accepting destiny and karma. Being symbolic, Cherry Blossom is often represented in Japan’s arts, music, films, manga and even on consumer goods. 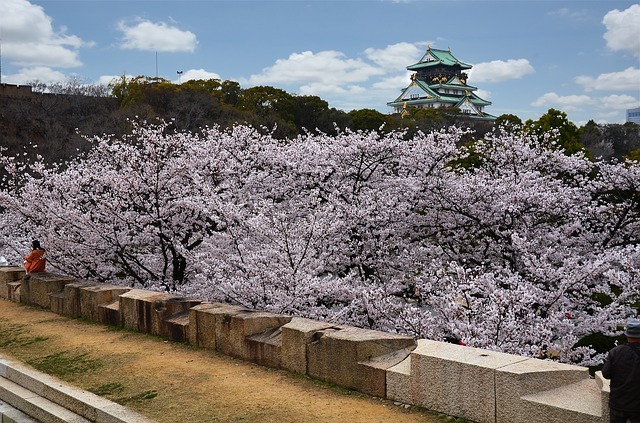 Sakura blooms in springtime, mostly from late March to early May so if tourists want to see its most majestic views, they must take note of the dates and the best places for the hanami or flower viewing. 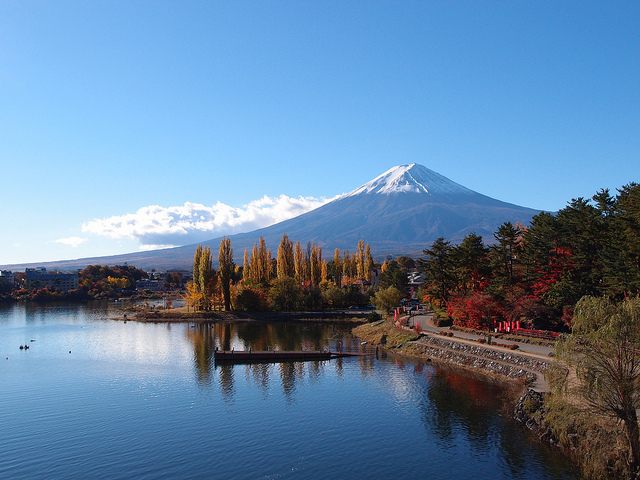 Fujigoko (Fuji Five Lakes) – At the northern base of Mount Fuji, the highest and most beautiful mountain in Japan, lies five distinct lakes. This area is the best spot to see the scenic view of the mountain and the Sakura. The flowers start to bloom in early April and blooms fully in mid April. Tokyo – Tokyo is the best place to see Japan’s most exciting time of the year, as the Sakura spreads tranquility all over the city on springtime. 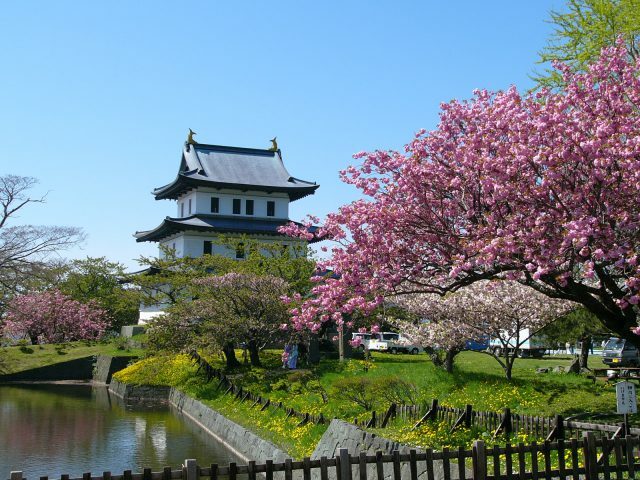 The city boasts with parks, gardens, rivers, riversides and other famous landmarks perfect for hanami. In Tokyo, first bloom is expected on March 23 and peaks on April 2. Osaka – In Osaka, visitors can enjoy walking under the Cherry Blossoms whether on daytime or at night. They can also participate in various Cherry Blossom festivals held in different locations across the city. 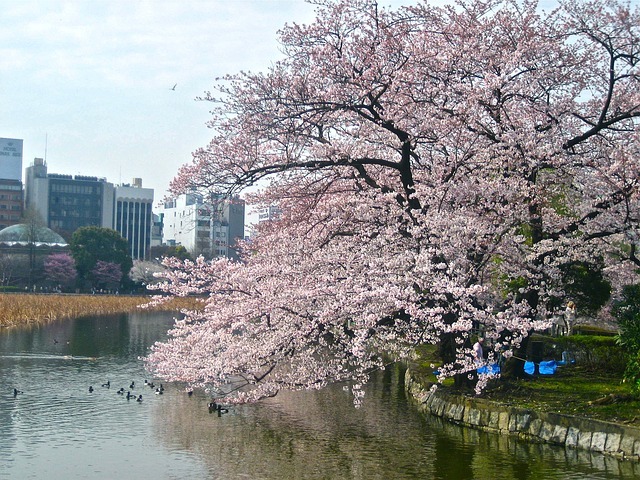 Some notable hanami spots in Osaka is home to 5000 cherry blossom trees. Expect the Sakura to bloom from March 23 to March 28, this year. 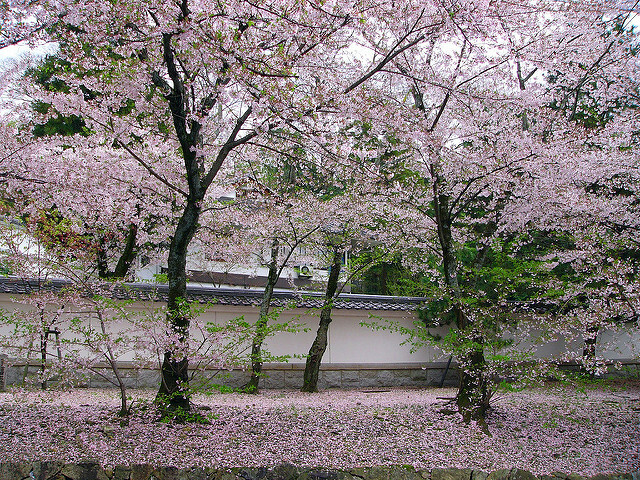 Kyoto – During springtime, Sakura gives Kyoto a mind-blowing atmosphere. Local and foreign visitors bustle the city’s canals, rivers, parks, temples, shrines and other hanami spots offering picturesque landscapes. Sakura is on full bloom here by March 28 to early April. Hokkaido – Sakura blooms a bit late in Hokkaido, around early to mid May, but this might be the place for the most gorgeous cherry blossom season. 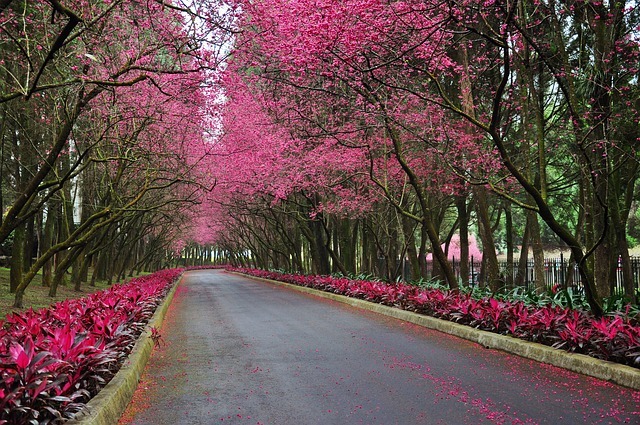 Landmarks, parks and even roadsides offer breathtaking views of tons of cherry blossoms. Guangzhou, the capital and the most populous city of the province Guangdong in southern China is home to the famous Spring Festival Flower Fair held yearly. It is dubbed as the “flower city” because of its emphasis on having gardens and greenery. During the festival, the streets are decorated with fragrant, colorful and beautiful fresh flowers, golden tangerines and miniature landscapes where people shop for flowers and gifts. The annual festive flower fair in Guangzhou originated 500 years ago to the Ming Dynasty. The forming of the festival is related to the city’s climate, history and culture. Guangzhou being subtropical, enjoys long days of sunshine and plenty of rainfalls, excellent for growing flowers. The large demand for flowers from the Guangzhou market lead to the formation of the festival for people to appreciate flowers, and the old saying “No flower fairs, no Spring Festival” had also evolved. In 1920, the festival began to be held regularly. 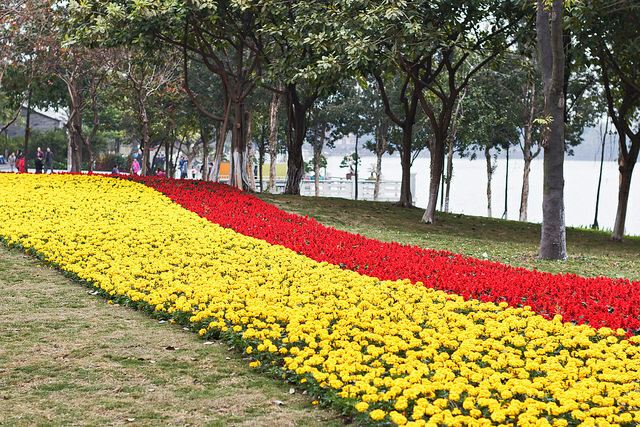 Nowadays, the annual flower fair is divided into 8 major markets all around the city of Guangzhou. 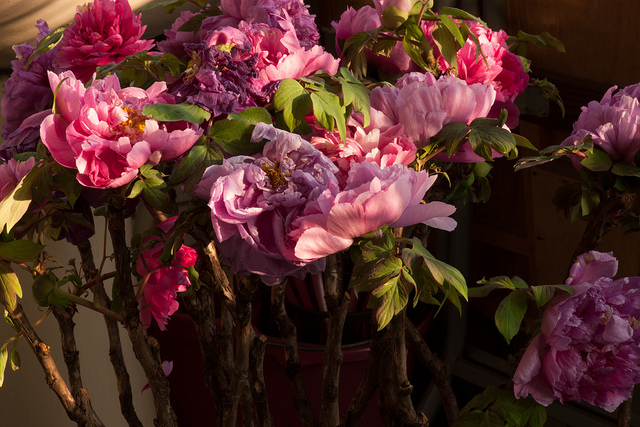 It is a Chinese tradition to welcome spring with flowers. In Guangzhou, it is customary to visit the flower fair on the eve of Spring Festival and buy potted trees with hanging tangerines. Tangerine trees symbolize a fruitful marriage, goodwill, good luck and prosperity or wealth. 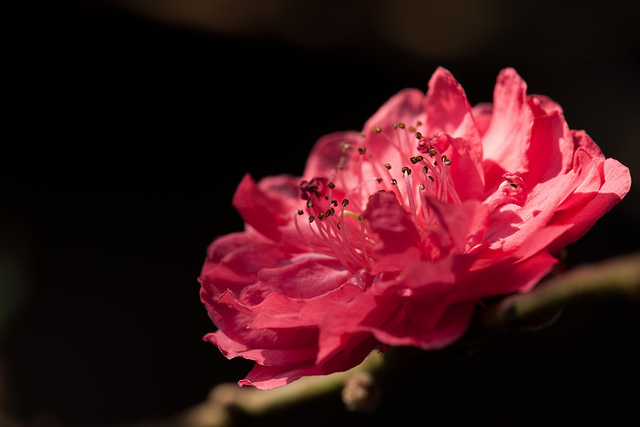 Other plants and flowers that people buy include – peach blossoms for romance, longevity and considered as the strongest defense against evil; lettuce for wealth generation and chrysanthemums for long life. On the contrary, if one comes back home from the fair empty-handed, that would mean a year of unhappiness.